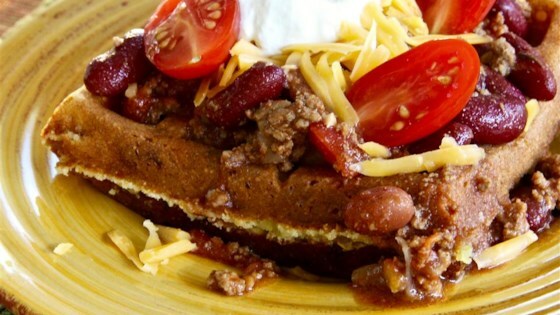 "Perfect brunch food, not your traditional waffle! Top with your favorite toppings. Try a fried egg!" Preheat a waffle iron according to manufacturer's instructions and lightly grease. Spoon batter into preheated waffle iron and cook according to manufacturer's instructions until golden brown, 5 to 10 minutes. Serving size may vary depending on the size of the waffle iron. Served this with chili and garnished with Fritos for some crunch. Delicious! I will make these again as it was a fun twist on traditional corn bread. Served them along Mexican Chicken Corn Chowder (on this site). Thanks for the recipe!